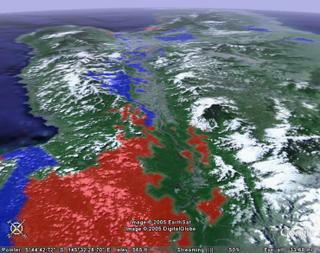 Google Earth (http://earth.google.com/) has a function for perspective views which can be quite useful. In the attached, I’ve draped an image of areas where taro (red) or banana (blue) is the dominant staple from the (PNG Farming Systems Database) over a view of northern PNG looking SE from a height of about 36 miles. Luigi, where in the software can you specify the overlay? And what type of file is your banana and taro overlay? The Solomon Islands government is pinning its hopes on a new agriculture strategy to help drive the economy back into the black. A five-year plan, developed by stakeholders in the newly formed Agriculture Council, targets the rural sector as a major player in its so-called 'Rural Livelihood Plan'. The 'Agriculture Sector Strategies Plan 2005 and Beyond' aims to help individual farmers achieve product quality standards, productivity and management levels. A feature article from the journal Mechanical Engineering: How do you design food-processing equipment if you know little of the culture in which it will be used? Breadfruit, called ‘ulu in Hawaiian, was one of the plants Polynesians brought in their sailing canoes when they discovered the Hawaiian Islands. It is a staple food throughout the Pacific, and in ancient Hawai‘i it was a crop of much greater nutritional, cultural, and political significance than its presentday status here suggests. The authors of this book assembled historical references to ‘ulu and did nutrient analyses to develop a picture of the tree’s former importance. 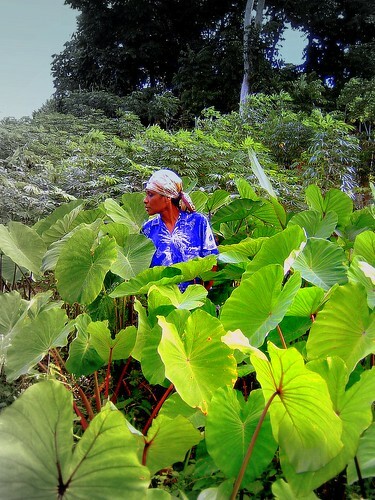 Through its manifold uses, its widespread cultivation, and its nutritional similarity to the other Hawaiian staple, kalo (taro), Hawaiian breadfruit is revealed to have had a profound role in the Hawaiian culture and the human ecology of the archipelago. This brief study of ‘ulu will reward those interested in Hawaiiana with a new perspective on a familiar tree of Hawaiian landscapes, a tree which—according to the authors—deserves much greater appreciation and use. It is often useful to be able to quickly visualize the location of a particular site or sites on a background of a satellite image. Google Map not only provides free satellite imagery for the whole world on the web, but also software for doing simple mapping with that imagery on your own website. 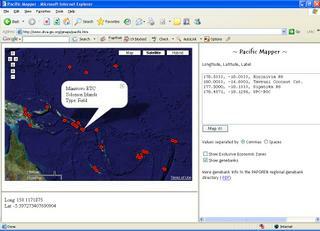 A colleague of mine, Dr Robert Hijmans of the University of California, Berkeley, has kindly set up a webpage at http://www.diva-gis.org/gmaps/pacific.htm which allows you to rapidly plot points for which you have latitude and longitude on a Google Map satellite image base map. He has included an option for also overlaying the EEZ of PICTs. I hope you find it useful. All feedback welcome. You can do more sophisticated spatial analysis for biological and natural resources management with the DIVA software available on the same site. From Jim Currie in FSM. I fully support the efforts described by Adelino Lorens concerning processing breadfruit whether for sale or home use. When Richard Byers was here last year, he demonstrated that local breadfruit could be ground, extruded and when dropped in hot oil it puffed up just like 'cheese balls'. I personally am addicted to 'Ulu' (breadfruit) chips from Samoa. I think these should completely replace the junkfood we import from elsewhere. If the cost is higher, so what. Junk food is a non-essential and if people want it, they can save toward it or make it themselves. If they decide to not buy or make, maybe that is even better since they avoid the empty calories that now show up in the obesity statistics. I'd even support a ban on imported junk food. From our possition COM/FSM, we are planning a two-pronged approach to the breadfruit issue and other staple crops as well. In the first and easiest case, we (Engly Ioanis, Marcellino Martins, and I are planning a research/ demonstration project in three of the states of FSM to demonstrate the preservation and use of Breadfruit as the basis for a balanced swine feed diet. There are tons of breadfruit that go to waste each year while we import pig feed that is primarily energy feed based. Even if we use more breadfruit for human consumption, there will always be damaged, diseased and excess available to be preserved as feed for pigs. Secondly, we will be hiring/acquiring a person - possibly through volunteer agencies or technical support agencies - to work full-time in Food Processing, Packaging and Marketing. One of the challenges for this person will be to develop a processing system to transform staple products to a readily useable product at a reasonable price. Possibly the extruding idea could be carried out to form a pelleted product in a sealed pack that could be easily boiled or micro-waved comparable to 'minute-rice' (that takes 10 minutes anyway). I fully expect that some of these have been developed in the region and I solicit any guidance in this topic in which I am less specialized. Thanks Luigi for sharing this, these are some excellent ideas, especially to encourage people in the Pacific to eat locally produced food and at the same time earning money. I am very impressed here in Thailand to see a lot of locally produced foods, like chips, noodles and other sweets made from rice, banana and taro. I think if we have researchers and investors who are committed in this we can produce some very good products out of our traditional food sources. Some researchers here in Biotec are very interested in lactic acid bacteria fermentation, and I talked with them, it is a good way of producing nutritious foods, which reminds me of our "masi ulu" fermented breadfruit biscuits, which is a traditional food in Samoa but I never tasted it. (I only learnt in high school the processing procedure but not in practice). That should be researched too, which bacteria that are involved in fermentation and also what kind of product we can get from it. I am also interested in the pig-feeds research stated in the news, because in Tuvalu, many breadfruits are wasted too, while people are buying very expensive feeds for pigs, but I think if NGOs and government create and support initiatives to produce products out of our own resources we can do and achieve much better than what we import. Thanks to all of you researchers in FSM, you are all inspirations to me a young Pacific researcher. Go for it and remember to share your findings and vinaka Luigi for the important network.